Wait until you see this immaculate four bedroom and two and a half bath La Cuesta pool home. From the moment you drive up and see the landscaping and exterior, you can tell how well maintained this home is. Windows everywhere attract abundant natural light. The property features a family room (currently converted to an over-sized office perfect for running a business out of if desired), a living room, a formal dining room, and a separate eating area inside the kitchen. Family room and living room feature Wood Burning Fireplaces equipped with top-sealing Lyemance dampers. A lovely guest bathroom completes the downstairs. Upstairs boasts a spacious master suite with a long wall of closets, vaulted ceilings, and en-suite bathroom. Across the hall are three ample sized bedrooms and a beautiful hallway bathroom. Another amazing feature about this home is the fixed stairway from the garage that leads to an over-sized storage area. Entire plumbing system has been coated to prevent leaks, new water heater, new garage door opener, newer furnace, whole house fan, security system, and much more. The backyard was built for entertaining. It has a covered patio, a sparkling swimming pool, an inviting spa, and multiple seating areas. Pool features safety fencing, Pool re-plastered and tiles updated in 2013, Newer Pool Pump, Newer Pool Heater, Pool Skimmer System rebuilt 2015. The home is located close to shopping and schools. 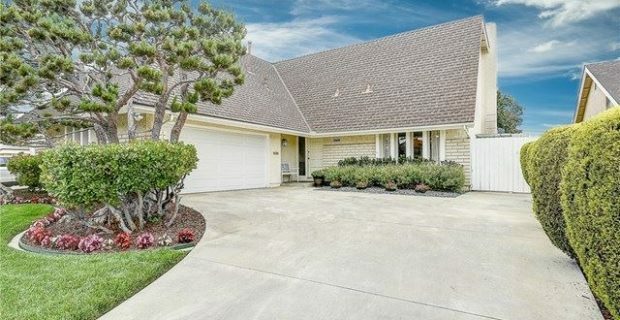 You do not want to miss seeing this Huntington Beach beauty!